Ford's RUTH robot is a tactile robotic arm used to evaluate the interior of car models. The intent is to make the testing process more uniform and scientific - or so they say. 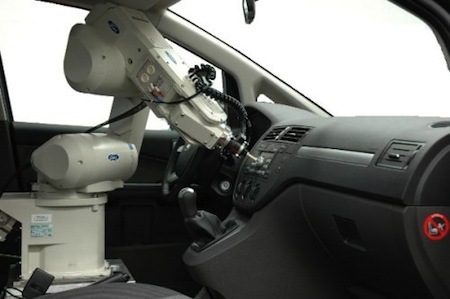 The Robotized Unit for Tactility and Haptics, or RUTH, has been used for several years at the automaker's European Research Center in Aachen, Germany, to check the interiors of the European versions of the new Focus and Fiesta, versions of which are coming to the United States in 2010. Ford says it's the first carmaker to use a robot like RUTH, which is a modified consumer packaging arm, to scientifically test interiors. Work by the machine is now being seen in production models around the world. To better respond to customer expectations for quality interiors, RUTH measures parameters such as roughness and temperature on points like the steering wheel, knobs and armrests. RUTH is able to act just like a human driver in many respects, manipulating knobs and adjusting air vents just like human drivers. "Robots have no wives," the driver said. "They are nonsexual. Robots have no friends, either. They are incapable of emotional relationships." "Can robots be fired?" "Sometimes." The robot drew his cab up before Eric's modest six-room bungalow. "But consider. Robots are frequently melted down and new robots made from the remains. Recall Ibsen's Peer Gynt, the section concerning the Button Molder. The lines clearly anticipate in symbolic form the trauma of robots to come." "Yeah." The door opened and Eric got out. "I guess we all have our problems." "Robots have worse problems than anybody." The door shut and the cab zipped off, back down the hill.